This is content from cyber-ironclad.com, devoted to XIXth century naval warfare. The Era of Jules Verne and Brunel, of technological revolution. Ships moved from wood, broadside guns and sails to turrets, steel and steam. The eighteenth century was a pivotal era for ships and ships warfare as well as in many other areas. It started at the dawn of the new century, with Fulton and other pioneer experiments and because over a period including ships built beyond any late eighteenth century to the early twentieth century (ending in 1905, years before the issue of Dreadnought), old fashioned tactics and relatively short range gunnery still prevailed: After all, Tsushima was fought at relatively short range in a classic broadside fashion. This section focuses on navies of the 1850’s to 1905, a timeframe able to classify many ships built, converted and sunk between. In fact, the historical episodes considered, it will also issue a navy punctual screenshot on a particular date. Birth of steamships, by Scottish-born engineer Fulton. A serie of steam-only ships will appear until the development of mixed ships (sail and steam) from the mid-1920s; By the 1830s there were quantities of mixed ships in service on civilian trade routes, which bring time reliability whereas previous ones were tributary, like in the past, of the elements. The Navy at that stage only get interested by small, fast mixed corvettes used as despatch vessels, to carry orders and personal between ships of the line; Thick black smoke, dirty coal were seen a liability for a military ship. Until 1850. Trafalgar: The last great ship-of-the-line battle. Mixed ships are more common, but the bulk of the workforce is made up of pure sailing ships, tall multi-deckers that tradition required and fast frigates, with impressive crews and a harsh discipline. A new kind of alliance of British and French forces against Russia in Crimea. 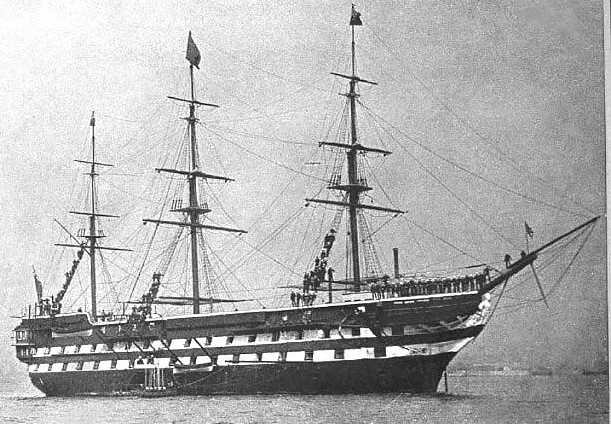 The two-decker steamship Napoleon demonstrated the usefulness of its propulsion, urging the British in their turn to convert many sailing ships. Also in this conflict, the very first ironclads of the Tonnante class showed a clear superiority over land fortifications. Another date to consider as it takes us to the beginning of the secession war, which lasts until 1865 and saw the development of new revolutionary ships. 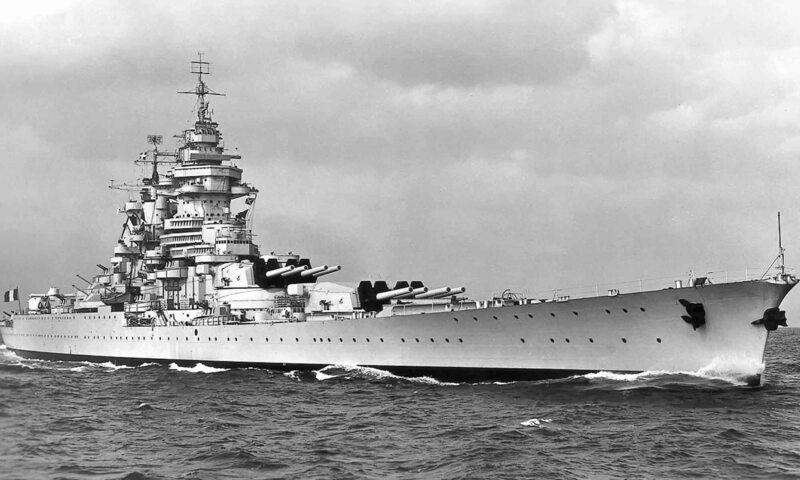 But also in Europe the commissioning of the world first all-iron battleships (Iron Duke) in response to the 1859 French ironclad Gloire. The new warring sea kings. HMS Conway, used as schoolship in the 1880s. 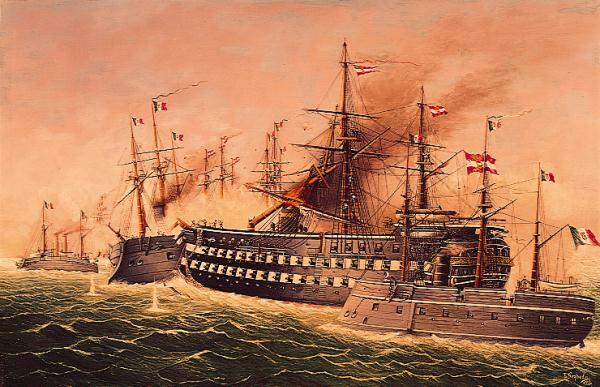 The Franco-Prussian War: Ironclads are now top the list of fleets, supported by many mixed vessels. If the war itself is ground-based and short, the panorama offered this year on the fleets of the world is appealing and a turning point where new solutions and experiments are tested, notably, the sail began to loose ground and the steam-only solution gain credits. 1870 duel between French Bouvet and Prussian Meteor. at the time of the Fashoda crisis, the face of world naval powers has changed: Several newcomers made their appearance in this game of maritime and colonial powers such as France and Britain: Unified Germany, Italy, Austria-Hungary, are in a position to stage an impressive potential, which herald the new equilibrium that will prevail in 1914. Russia will soon reach the height of his power, while Japan emerged from feudalism to enter resolutely into the race with the industrial empires of the world, and USA obsolete “old navy” is on the brink of change. The sail is clearly dying, but torpedo and mine are now serious threats. A new era. The inherited chivalrous spirit gives way to cold reality mechanics. is the first illustration of this new era : Japan attacked China, still partly in the hands of Western outlets, and is mostly a comparison of western technologies and tactics through a duel of Asian fleets, one agonising, another rising. This is the battle of Yalu. is the “splendid little war”, which saw the old, crumbling Spanish colonial Empire facing a dashing, young American nation that awakened as a sea power. 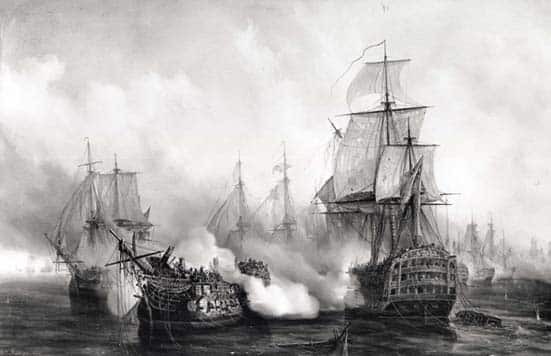 The great conflagrations of the past (Trafalgar, Aboukir) are taught as the most famous “classic” battles for ships of the line, to the same level as Salamis and Lepanto for galleys. However on the second half of the century, a new form of confrontation emerged out of traditional patterns of naval tactics because of industrial era’s many innovations. We do agree that the last great naval battle of ships sailing took place at Navarin in 1827. It was a coalition of Russian ships, English and French associates against the fleet of the Ottoman Empire, still formidable at that time, old adversary of the Western powers and Russia since precisely Lepanto in 1571. Specifically, some naval battles of the period will not be included, the simple fact that the industrial era is a period that begins roughly in 1820. War of the Duchies between Denmark and Prussia in 1864 and a few others. -Battle of Sorondo on the Orinoco in Venezuela in 1812: Spanish victory over the insurgents. -Battle of Lake Maracaibo (1823): Revenge of Venezuela over Spain. -Battle of Port-Del Buceo (1814): In the Rio de la Plata, the Argentinians destroy a Spanish squadron. -Battle of Lake Erie (1813): American Victory. -Battle Lake Champain (1814): Same scenario. -Battle of Chios (1822): Greek victory against the Turks. -Battle of the Bay of Suda (1825): Greek victory against a Turkish-Egyptian coalition. -Battle of Navarino (1827): Victory coalition of British, French and Russians on Turkish-Egyptian fleet. -Battle of Los Pozos (off Buenos Aires, 1826): Argentina win against Brazil. -Battle of Juncal (off Uruguay, 1827): Same. -Battle of Vila del Carmen (coast of Patagonia, 1827): Same. -Battle of Monte Santiago (1827): Brazil’s Revenge. -Battle of Cruces (1828): Same scenario. -Battle of Braila: Russian Victory. -Battle of Vila da Praia (Azores, 1829): Victory of the Liberals on the absolutists. -Battle of Cape St Vincent (Gibraltar, 1833): Same scenario. -Battle of Islay (Pacific, 1838): Combat undecided. -Battle of Casma (Pacific, 1839): Chilean victory. -Battle of Campeche (1843): Victory insurgents Yucatan and the Mexican Texans. -Battle of Tourane (1847): French victory over the fleet Thai imposing French colonial rule for a hundred years. -Battle of Pitsunda (1853, black sea coast of Georgia): Russian victory over the Turks. -Battle of Sinope (1853, Black Sea): Same scenario. -Battle of Hampton Roads (1862, coast of Virginia): Combat undecided between Virginia and Monitor. -Battle of Memphis (1862, Shelby County, Battle River): Union victory. -Battle of Cherbourg (1864): Fighting between CSS Alabama and USS Kearsarge and win it. 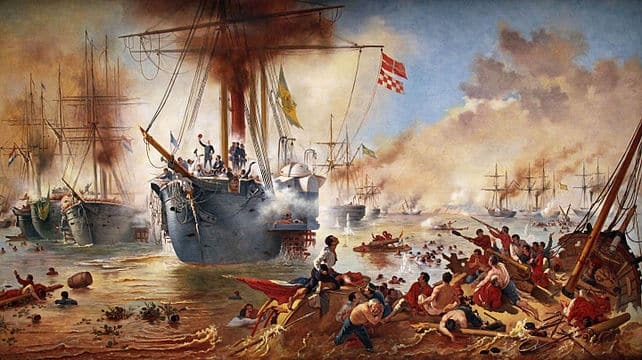 -Battle of Mobile Bay (1864, coasts of Alabama): Union victory. -Battle of Rügen (1864, Baltic): Danish victory over the Prussians. 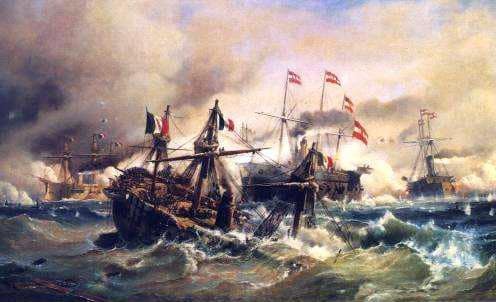 -Battle of Heligoland (1864, North Sea): Danish victory over a Prussian-Austrian coalition. -Battle of Riachuelo (Rio Prana, Paraguay, 1865): Brazilian victory over Paraguay. -Battle of Papudo (Valparaiso, 1865): Chilean victory over Spain. -Battle of Abtao (islands Chiloe, 1866): Peruvian-Chilean victory over Spain. -Battle of Callao (peruvian Coast, 1866): Victory in Peru to Spain. -Battle of Lissa (Adriatic, 1866): Austro-Hungarian victory over Italy. -Battle of Hakodate (1869): Victory of the Imperial fleet in the fleet of the Republic of Ezo. 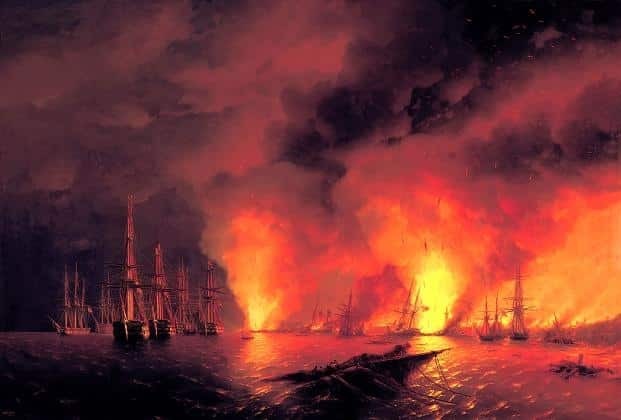 -Combat in Havana (1870): Combat undecided between the gunboats and Bouvet Meteor. -Battle of Chipana (1879): Combat undecided between Peruvian and Chilean corvettes. -Battle of Iquique (1879): Win two ships including a battleship Peruvians against two Chilean ships. The same day, one of the Peruvian vessel was then routed by a Chilean unit in Punta cranes. -Battle of Angamos (1879): Chilean contrast with a whole squadron deployed against the battleship Huascar. -Battle of Foochow (1884): French squadron victory of the Chinese fleet. 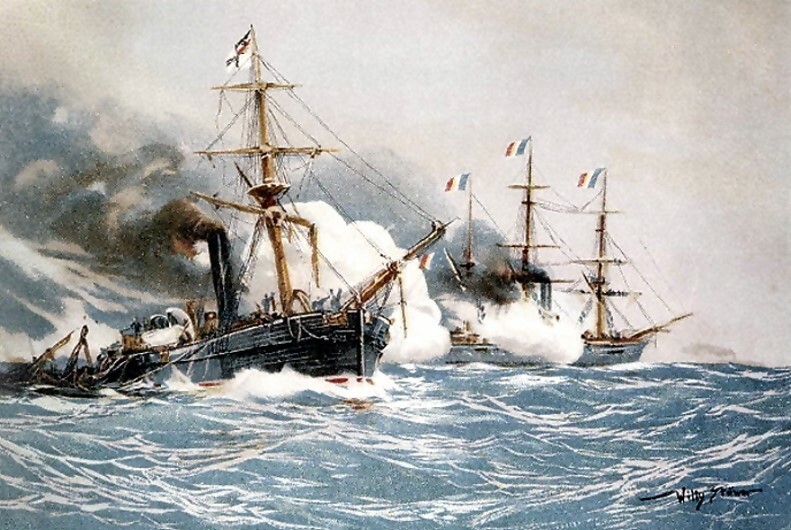 Battle-Shei-Poo (1885): French torpedo boats against two Chinese frigates which destroyed one another. -Battle of Fengdao (1894): Japan’s victory over Chinese units. -Battle of Weihaiwei (1894): Japanese victory over a Chinese fleet. –Battle of Yalu (1895): Same scenario. -Battle of Manila Bay (Cavite): American victory over a Spanish fleet at anchor. -Battle of Cardenas (Cuba): Battle between three and five American Spanish gunboats. Spanish victory. -Battle of Santiago de Cuba: American victory over the Spanish squadron in Cuba. 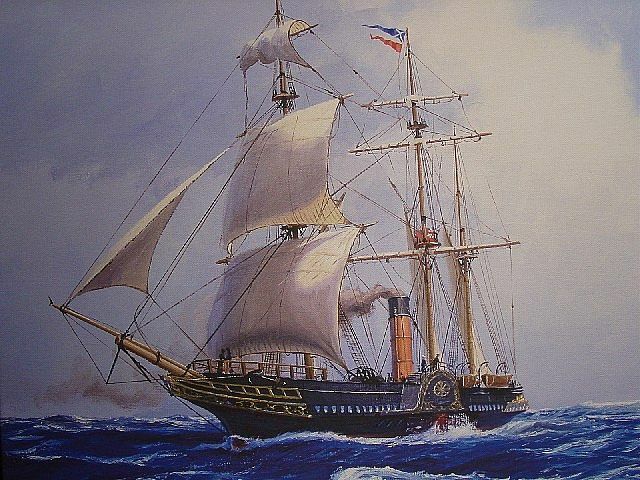 The steam enters in the fleet, first in a minority, then more openly in 1850 with the first steam ship of the line, designed by the French Dupuy de Lome. The “Napoleon” is its name, is a three-decker, the British look with irony and disdain. The size of boilers and coal bunkers, dirt, black smoke, everything is good to distrust them. In addition the mode of propulsion is then known impeller, fragile on a warship as directly bordered by the enemy. But nobody thinks so adapted to this new rare vapors of Commerce, the “worm” taken from the great Archimedes. It is well protected under the waterline. The Napoleon, who manages to have a steam propulsion without too much interference and maneuvering space on board, seems to be a good compromise. 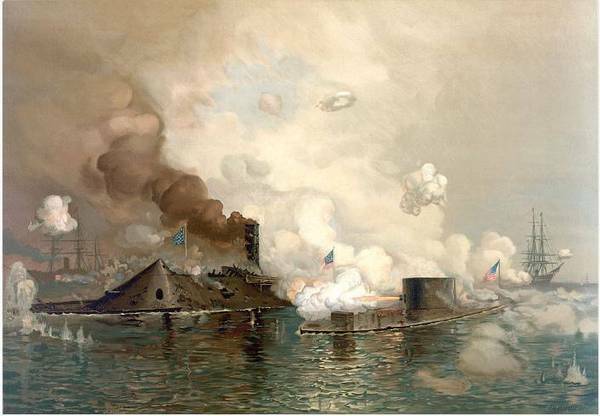 Among the operations of the Civil War, we note the Battle of Hampton Roads, on the east coast in 1862, which opposes the first two monitors, the Confederate Merrimack battery sets, and the USS Monitor and its revolutionary single piece of artillery turret. John Coles, the creator of the turret and the lookout, and John Ericsson, contribute. The numerical inferiority of Southern Naval condemn a priori any major action, and they will attempt during the war to break the blockade and to trade war with privateers, including the famous Alabama and Shenandoah. There were few real “battles” more usually duels or coastal bombardments, such as the destruction of the USS Housatonic by the HL Hunley submarine. The Mississippi and its tributaries saw bombardment of forts like on the James River. Numerous monitors were built, converted from older ships. Battle of Hampton Roads: Duel between ironclads. Then comes the battle of Lissa, in the Austro-Italian war of 1866. His main lesson was dramatically confirmed the relevance of the spur in naval combat. This feature had vanished from the architecture of warships since very ancient times, since the Romans, already longer believed in the virtues of the collision at the time of war against Carthage. 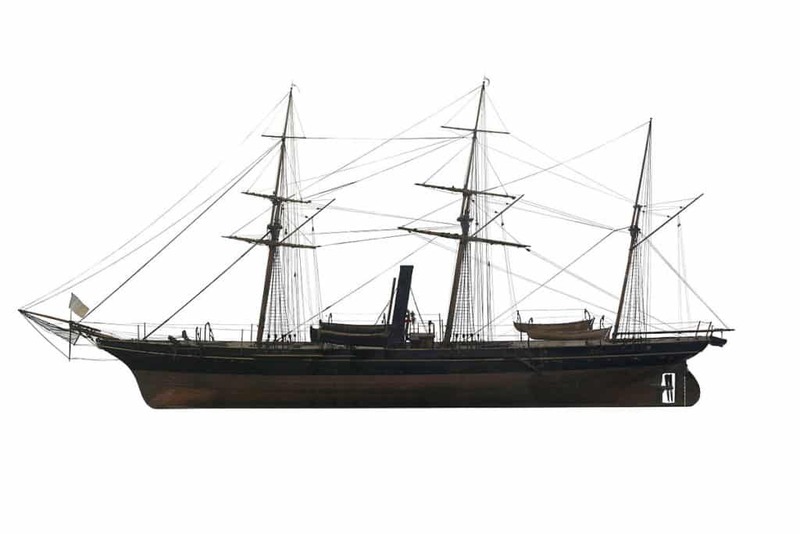 With the arrival of the First Prev vapors and autonomy motive of these vessels, similar to the galleys, propelled by oars, we thought its reintroduction, but it was only with the first cuiassés that it was decided to resume with this accessory: It was indeed a very strong hull and propulsion reliable and powerful to be effective. The sloop (“aviso”) Bouvet model of 1870. During the Franco-Prussian War of 1870, the number of the French navy exceeded by far those of the Prussian fleet. In fact apart from an aborted project of landing in Denmark, which would probably have resulted in a large-scale direct confrontation between the two navies, the only naval encounter took place November 9, 1870 at Havana between the Bouvet and the gunboat Meteor. It ended in a “tie” the two ships leaving out of action.